Bahco 1/4" Drive Socket Set - 25 Piece. The Bahco SL25 is a handy socket set complete with 12 sockets made from hardened chrome vanadium. 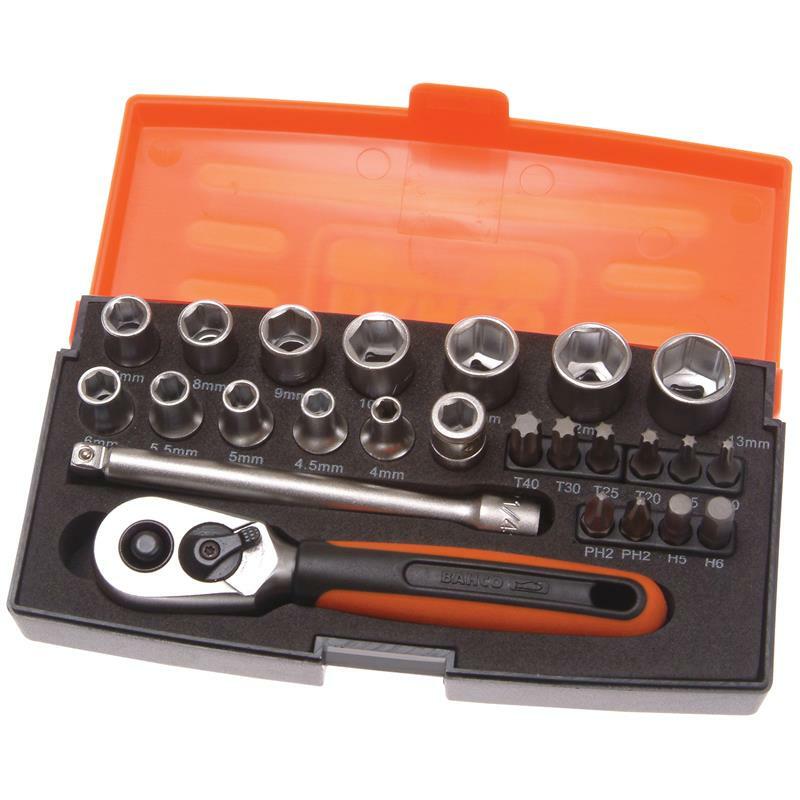 It is ideal for the home, garage or car, the socket set will give years of service as it is made from a hard wearing steel material. The set has all the most common sized sockets, so the set is well equipped to tackle any job in or around the home. It also has a compact sturdy soft-grip handle with a thumb slide direction lever, a 1/4in 100mm extension bar for hard to reach places, 6 piece Torx bit set for security type bolts, 2 x PH2 standard screwdriver bits and 2 x Hex drive bits. The socket set is supplied in a sturdy high density polythene carry case with sponged lining that is labelled with the corresponding items for quick and easy identification. 1 x 1/4in Reversible Quick Release Ratchet. 12 x Hex Sockets: 4, 4.5, 5, 5.5, 6, 7, 8, 9, 10, 11, 12 & 13mm. 2 x PhillipsA screw with a head having two intersecting perpendicular slots and a screwdriver with a tip shaped to fit into these slots. 2 x Hex Bits: 5 and 6mm. 6 x TorxTorx is the trademark for a type of screw head characterised by a 6-point star-shaped pattern. A popular generic name for the drive is star, as in star driver or star bit. Bits: TX10, TX15, TX20, TX25, TX30 & TX40. 1 x High Density Plastic Case. 2 x Phillips Bits: PH2. 6 x Torx Bits: TX10, TX15, TX20, TX25, TX30 & TX40.